Education does not mean just the ability to read and write. Education should rather make a person more aware and responsible. 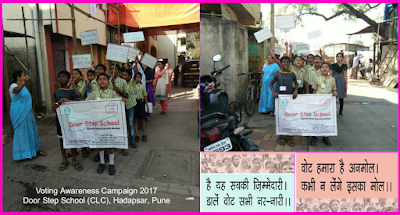 The children at Door Step School - Community Learning Center (CLC) recently demonstrated their social awareness as well as sense of responsibility. The citizens of Pune will be voting for Municipal Corporation elections on 21st of February 2017. The children at DSS CLC in Hadapsar decided to create awareness among their own community about importance of voting. They prepared placards with slogans like "Hai ye sab ki zimmedari, Daale vote sabhi nar-nari" (Voting is the duty of every man and woman); "Vote hamara hai anmol, Kabhi na lenge iska mol" (Our vote is precious, we will not sell it), and so on. Around 25 children took out a morning rally in Vaiduwadi Vasti in Hadapsar. With the placards and sloganeering, the group grabbed attention of people preparing or leaving for work in the morning. Parents of the participating children were amused with this mini-rally, while onlookers were curious to know what these children were promoting. 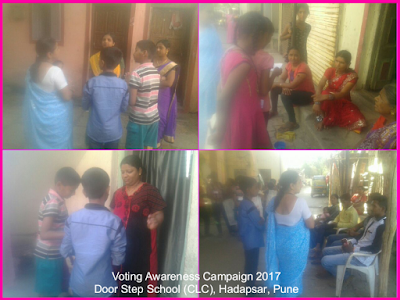 In the afternoon, children visited households in the community for one-to-one campaigning. They met the ladies at their houses and explained the importance of voting. They also approached the men at corners and shops, requesting them to exercize their right to vote. Success of this voting awareness campaign will not be measured in number of people voting next week. It will be measured in terms of a more aware and responsible future generation in the making!